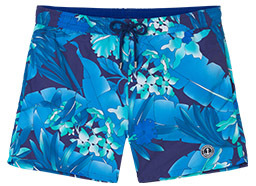 This tropical leaves printed swim shorts immerses you directly in summer, it is ideal for summertime. Slim fit mid-length short. Navy blue elasticated drawstring waist. Europann badge on left leg. Two front slash pockets and back zipped pocket. 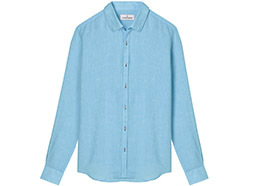 Fabric resistant to sea water and chlorine, suitable for quick drying. Delivered with a waterproof transparent bag.